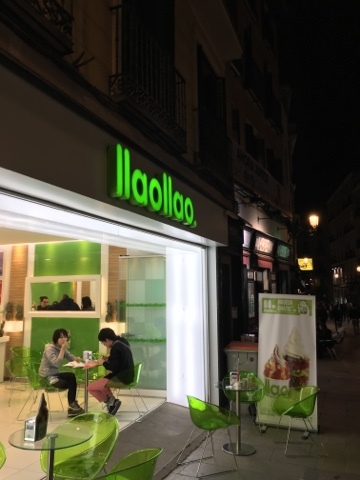 One evening in Madrid we fancied a post dinner snack and spotted this small frozen yogurt place called llaollao. Having been here a few more days now we understand that like Subway in the UK it's a rather extensive chain, but at the time it was maybe the 2nd I'd seen. It's a brightly lit beacon of coolness in a warm Spanish night. The yogurt comes out of Mr. Whippy style machines on the back wall. 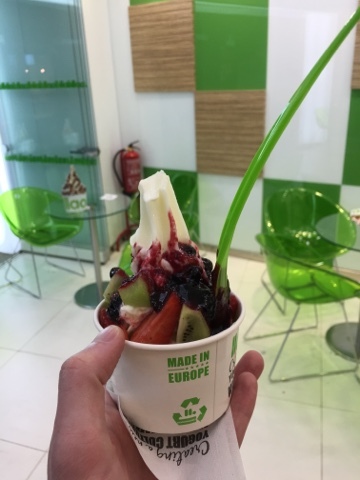 It's all very green and white and the selections of toppings are extensive. I had Kiwi, Strawberry and Fruits of the forest sauce which initially I thought may have been a wasted choice but it was a really nice addition and brought the flavours out well. It also made everything purple. The little green ladle is coming home with us because we have an ice-cream maker. There is a rival chain with pink ladles too! Apparently this is a global chain. While I have no doubts that this shop would do amazingly in the UK (on the three days a year that it was warm enough for long enough to justify this) I don't think a UK wide chain would be viable. It would also need to serve warm drinks and cakes for the rest of the year, or more realistically just be a little machine at the back of a Subway store. 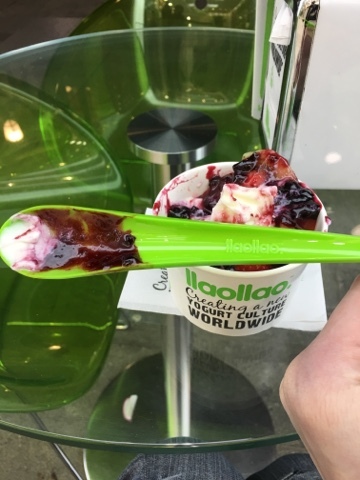 I love visiting here and Smooy when I'm in Spain, the white chocolate topping from Llaollao is excellent!